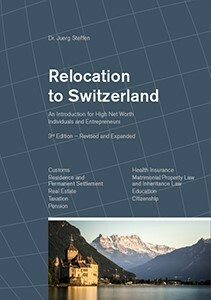 This book is an indispensable guide for high net worth individuals and entrepreneurs considering relocating to Switzerland and will also be of great value to their advisors. Dr. Juerg Steffen has compiled a comprehensive overview of the most important topics that should be taken into account when planning such a move, such as immigration law, customs, taxation, real estate, inheritance law, and health insurance. Other relevant topics featured are permanent residence and citizenship, pension, property law, and education. This revised and expanded edition has been written by an impressive team of leading experts who present complex topics in an accessible way and guide the reader through the relocation process with ease. Juerg Steffen is the Chief Executive Officer of Henley & Partners. Juerg has over 30 years’ experience in the financial services industry and is widely regarded as a leader of the investment migration industry. After joining Henley & Partners in 2013 to set up the firm’s Singapore office, Juerg went on to establish Henley & Partners as a key player in what has become one of the industry’s key regions. Later appointed Chief Operating Officer of the group, Juerg has played a pivotal role in growing the firm and, indeed, the investment migration industry at large, improving Henley & Partners’ operational standing and developing key structures and processes that enable the firm to keep the industry-leading position it enjoys today. Before joining Henley & Partners, Juerg was a personal advisor in the family office of one of Europe’s wealthiest families. Prior roles include serving as a member of the management board and head of the Wealth Planning department of a leading private bank in Austria. Juerg has also been a Director in the Cross-Border Wealth Planning department of UBS in Zürich, where he advised high-net-worth individuals and key clients in complex matters regarding financial, tax, succession, and residence and citizenship planning. He has also established and developed a private bank operation for one of the leading banks in Switzerland and is the editor of the definitive books on HNW relocation to Austria and Switzerland.